Although the exact pathophysiology of SLE is not clearly understood, it is associated with genetic, environmental, hormonal, and immunological factors. Vitamin D deficiency is one of the environmental as well as immunological factors in this regard. Vitamin D is a steroid hormone with established effects on bone and mineral homeostasis. Recent evidences support its potential immunomodulatory effects on both innate and adaptive immune responses, which could be explained by the presence of Vitamin D receptors on the surface of antigen-presenting cells, natural killer cells, and B- and T-lymphocytes. Most of the recently published review studies in this field have suggested that Vitamin D can be considered as a potential risk factor for SLE rather than a consequence of it. Most of these studies have recommended that to establish the mentioned suggestions, it is necessary to evaluate the clinical efficacy of Vitamin D supplementation in this group of patients or at-risk population. Some interventional studies have investigated the impact of Vitamin D administration on disease activity as well as other related complications such as fatigue and protienuria.,In vivo studies on murine models of SLE have demonstrated a significant improvement in dermatologic manifestations of the disease, proteinuria, and increased survival of SLE. Regional studies have reported that with an estimated prevalence rate of 40/100,000 population, SLE is considered a relatively common disease in Iran. Further, some studies have also indicated that most of the newly diagnosed SLE patients were Vitamin D deficient. Moreover, they showed an association between Vitamin D deficiency and disease activity among the affected patients and emphasized the importance of routine screening of Vitamin D deficiency and effectiveness of its treatment. Thus, considering that both global and regional studies recommended investigating the effectiveness of this supplement through interventional studies to obtain more conclusive results for appropriate management of SLE and preventing its related complications, we aimed to study the effectiveness of Vitamin D administration on disease activity of Vitamin D-deficient SLE patients. In this randomized, double-blind, placebo-controlled trial, that was parallel with control and placebo groups, patients with SLE referred to rheumatologic clinic of Al Zahra Hospital, affiliated to Isfahan University of Medical Sciences (Isfahan, Iran), were enrolled. A total of 97 participants from September 2013 to March 2014 were selected by simple random sampling method, and then randomly allocated to two groups by block randomization method; however, only ninety patients completed the 6-month follow-up period. Both patients and the personnel who gave the drug to the patients were blinded to treatment assignment. The study protocol was approved by Regional Ethics Committee of Isfahan University of Medical Sciences (research project number; 393703). The inclusion criteria were patients aged >18 years, those who fulfilled at least four of the American College of Rheumatology (1982) classification criteria for SLE, were under treatment for SLE, and had levels of Vitamin D (25-hydroxyvitamin D [25(OH)D]) <30 ng/ml. Patients with a history of any chronic systematic or inflammatory disease which affects Vitamin D absorption, cirrhosis, myocardial infarction, malignancy, renal stones or hypercalcemia, and hospitalization due to the complications of SLE during the study were excluded. After explanation of the protocol of the study, written informed consent was obtained from each selected patient. All patients were examined clinically by a rheumatologist. Demographic characteristics of the patients as well as history of the disease, medications, and activity of the disease were recorded for each patient using a checklist. Disease activity was measured using SLE disease activity index (SLEDAI). Peripheral blood sample was obtained from the studied patients after overnight fasting. Blood samples were taken for complete blood count, erythrocyte sedimentation rate (ESR), C-reactive protein (CRP), C3, C4, anti-double stranded DNA (dsDNA), blood urea nitrogen, creatinine, and Vitamin D level at baseline. Urine samples were obtained for protienuria and hematuria. Patients in interventional group received Vitamin D (50,000 unit/weekly) for 12 weeks and then 50,000 unit/monthly for 6 months. Vitamin D3(soft gel capsules containing 50,000 IU) was supplied by Zahravi Pharmaceutical Company (Tabriz, Iran) and placebo was supplied by the same company. 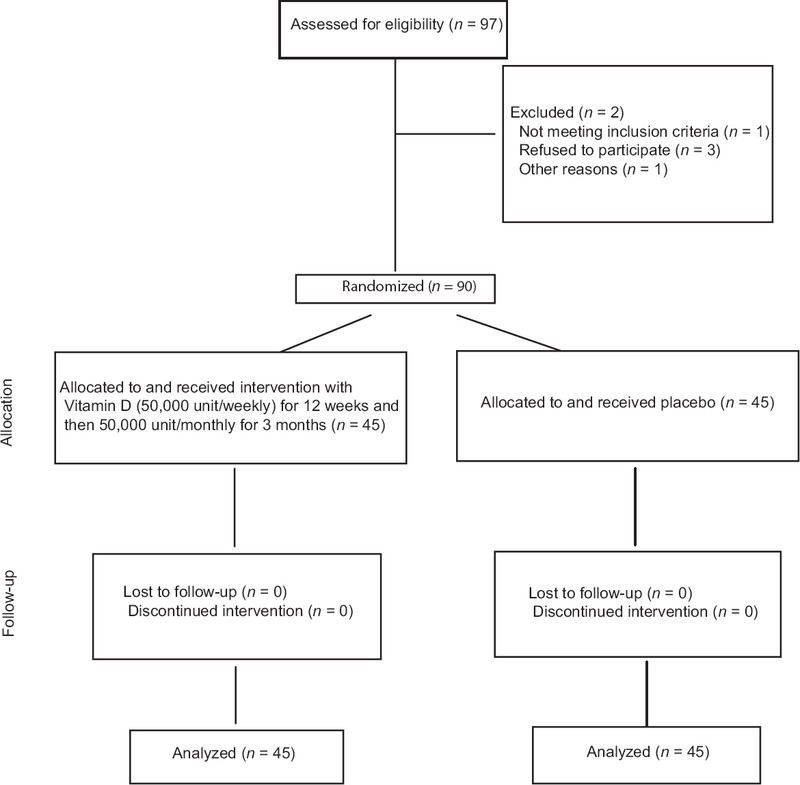 The level of Vitamin D and SLEDAI was measured after intervention period in interventional and placebo groups and compared. Consort diagram of the study is presented in [Figure 1]. Serum concentration of 25(OH)D was analyzed using the chemiluminescent immunoassay (CLIA) method (25(OH)D CLIA Kit, DiaSorin-Stillwater, MN, USA). The titer of anti-dsDNA antibodies was detected by ELISA method. Levels of C3 and C4 components of complement were measured by nephelometry. ESR and CRP were measured by standard kits and using an autoanalyzer (Prestige 24i, Japan). Statistical analysis was performed using SPSS software version 20 (SPSS Inc., Chicago, IL, USA) and paired t-test or Chi-square test and repeated measure ANOVA test. P < 0.05 was considered statistically significant. During this trial, ninety Vitamin D-deficient SLE patients (9 men and 81 women) were selected and randomly allocated in two groups, namely interventional (n = 45) and placebo (n = 45) groups. 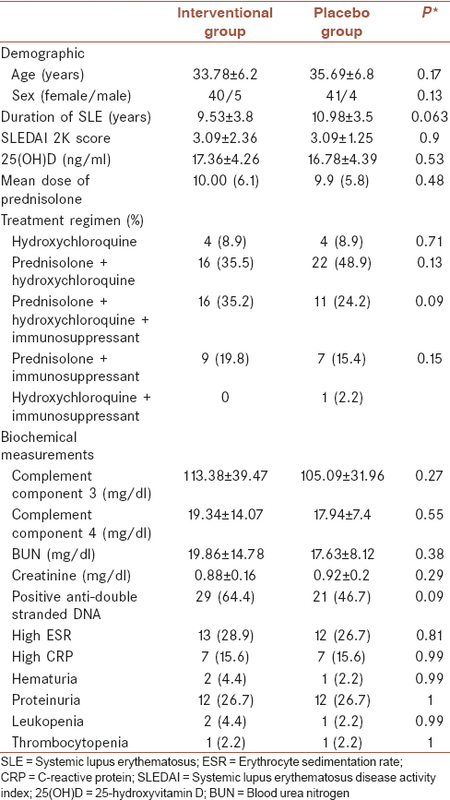 Baseline characteristics, biochemical measurements, and different treatment regimens of the studied population are shown in [Table 1]. Baseline characteristics in the two groups were similar (P > 0.05). 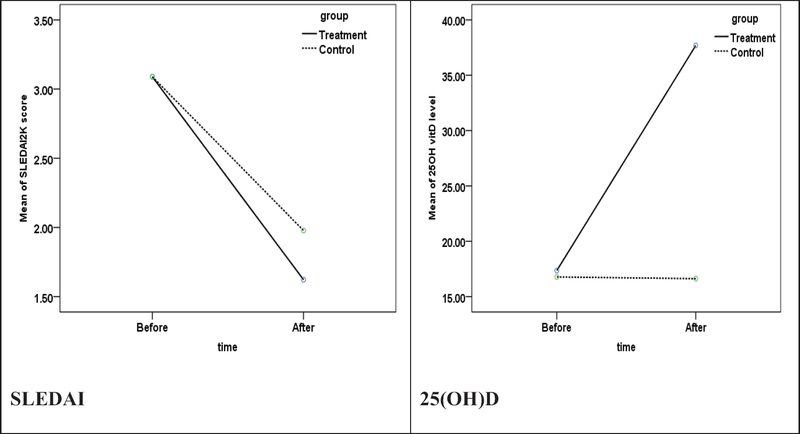 The mean level of 25(OH)D and SLEDAI before and after intervention is shown in [Figure 2]. The mean of Vitamin D was increased significantly in interventional group (17.36 ± 4.26 ng/ml vs. 37.69 ± 5.92 ng/ml, P < 0.001). The mean of Vitamin D had no significant difference before and after intervention in placebo group (16.78 ± 4.39 ng/ml vs. 16.62 ± 4.61 ng/ml, P = 0.53). The mean of disease activity (SLEDAI) was not different significantly before and after Vitamin D administration (3.09 ± 2.36 vs. 1.62 ± 1.25, P = 0.39). The mean of disease activity (SLEDAI) was not different significantly before and after intervention in placebo group (3.09 ± 1.2 vs. 1.98 ± 2.47, P = 0.42). In this trial, we evaluated the effectiveness of Vitamin D supplementation on the disease activity of Vitamin D-deficient SLE patients. The findings indicated that though the serum level of Vitamin D increased significantly after Vitamin D administration, the level of SLEDAI did not improved significantly. As mentioned, several studies have indicated the high prevalence of Vitamin D deficiency among patients with SLE and recent studies also have shown its association with disease-related complications, disease activity as well as the rate of morbidity and mortality. Although most of the related papers have recommended performing placebo-controlled studies for evaluating the efficacy of Vitamin D administration in reducing SLE disease activity, in literature review, we have not found many studies in this regard. Recently, Sakthiswary and Raymond in Malaysia have systematically reviewed the clinical importance of Vitamin D in SLE patients. They reviewed 22 studies in this field; most of them were cross-sectional studies. According to their results, most of the studies indicated statistically significant inverse relationship between Vitamin D and SLE disease. Some of them did not show any association. Only one of the studies was interventional and had investigated their relationship by administration of Vitamin D.
In the first interventional study which was not randomized, Ruiz-Irastorza et al. in Spain have studied the impact of oral Vitamin D supplementation on the disease activity of eighty SLE patients with low baseline Vitamin D levels. They did not demonstrate any significant correlation between the level of Vitamin D and SLEDAI. since then a few studies were done in this field. Abou-Raya et al. in Egypt examined the effect of oral cholecalciferol 2000 IU/day for 12 months on disease activity of SLE patients with serum Vitamin D level of <30 ng/ml. They showed a significant improvement on disease activity of the studied population. Petri et al. in the USA in a prospective study among 763 patients with SLE and with 25(OH)D level of <40 ng/ml have evaluated the effectiveness of 50,000 units of Vitamin D2 weekly plus 200 units of calcium/Vitamin D3 twice daily on the disease activity. They found a significant increase in the level of 25(OH)D and a significant decrease in disease activity. In spite of observed significant reduction in disease activity, they concluded that the clinical importance is relatively modest. Recently, Andreoli et al. have compared the efficacy and safety of two different monthly regimens, a standard (25,000 UI/monthly) and an intensive (300,000 UI initial dose followed by 50,000 UI/monthly) regimens on the disease activity of 38 premenopausal women. Their results indicated that intensive therapy is more safe and effective for increasing the level of Vitamin D to is recommended level, but both the studied regimens neither had significant effect on disease activity nor the serology of SLE. Our results were similar to that reported by Andreoli et al. and Ruiz-Irastorza et al., We did not find any significant improvement in SLE disease activity. Observed differences in the findings of the mentioned studies may be due to methodological and interlaboratory variations. However, the role of genetic susceptibility and ethnic variation could not be ignored. In addition, it seems that the higher dose of Vitamin D with long-term treatment course might have more favorable outcomes. There are possibilities that patients with SLE are more prone to Vitamin D deficiency due to factors such as limited outdoor activity, use of photo-protective agents, renal function impairment, and chronic use of pharmacological agents, which reduce the absorption of Vitamin D and alter its metabolism. Furthermore, anti-Vitamin D antibodies may enhance the plasma clearance of Vitamin D. Hence, it is suggested that higher dose of Vitamin D is needed for patients with SLE or the cutoff for Vitamin D deficiency in this group of patients should be compared with the general population and appropriate cutoff value should be determined. In addition, recent studies have indicated that to achieve the proper immunological outcome in patients with SLE, higher sustained level of 25(OH)D for longer duration is required. The limitation of the current study was small sample size of patients and lack of baseline information regarding the level of Vitamin D in the studied population at the time of diagnosis. It is recommended that for obtaining more accurate results, we should compare different doses of Vitamin D administration on disease activity. Future studies should be designed also to determine the effectiveness of Vitamin D administration in different phases of the disease, i.e. at the time of diagnosis or in remission phase to provide more effective management protocol. The findings of the current study indicated that Vitamin D administration has no significant effect on the SLE disease activity in Vitamin D-deficient SLE patients. According to our study, it is suggested that using Vitamin D in patients with SLE could not have better outcomes in this regard. However, there are many unknown environmental or biological factors which are associated with the disease activity of SLE and have not been identified yet. D'Cruz DP, Khamashta MA, Hughes GR. Systemic lupus erythematosus. Lancet 2007;369:587-96. Khorvash F, Shirani E, Askari GR, Mousavi SA, Sayedbonakdar Z, Fatemi A. Evaluation of vasomotor reactivity in systemic lupus erythematosus patients and its comparison with the control group. J Res Med Sci 2013;18 Suppl 1:S47-50. Saadatnia M, Sayed-Bonakdar Z, Mohammad-Sharifi G, Sarrami AH. Prevalence and prognosis of cerebrovascular accidents and its subtypes among patients with systemic lupus erythematosus in Isfahan, Iran: A hospital clinic-based study. Int J Prev Med 2014;5:123-6. Ashtari F, Ajalli M, Shaygannejad V, Akbari M, Hovsepian S. The relation between Vitamin D status with fatigue and depressive symptoms of multiple sclerosis. J Res Med Sci 2013;18:193-7. Boonstra A, Barrat FJ, Crain C, Heath VL, Savelkoul HF, O'Garra A. 1 alpha,25-dihydroxyvitamin D3 has a direct effect on naive CD4(+) T cells to enhance the development of Th2 cells. J Immunol 2001;167:4974-80. Cutolo M, Otsa K. Review: Vitamin D, immunity and lupus. Lupus 2008;17:6-10. Hewison M. Vitamin D and the immune system: New perspectives on an old theme. Rheum Dis Clin North Am 2012;38:125-39. Deluca HF, Cantorna MT. Vitamin D: Its role and uses in immunology. FASEB J 2001;15:2579-85. Yap KS, Morand EF. Vitamin D and systemic lupus erythematosus: Continued evolution. Int J Rheum Dis 2015;18:242-9. Ben-Zvi I, Aranow C, Mackay M, Stanevsky A, Kamen DL, Marinescu LM, et al. The impact of Vitamin D on dendritic cell function in patients with systemic lupus erythematosus. PLoS One 2010;5:e9193. Attar SM, Siddiqui AM. Vitamin D deficiency in patients with systemic lupus erythematosus. Oman Med J 2013;28:42-7. Souto M, Coelho A, Guo C, Mendonça L, Argolo S, Papi J, et al. Vitamin D insufficiency in Brazilian patients with SLE: Prevalence, associated factors, and relationship with activity. Lupus 2011;20:1019-26. Schoindre Y, Jallouli M, Tanguy ML, Ghillani P, Galicier L, Aumaître O, et al. Lower Vitamin D levels are associated with higher systemic lupus erythematosus activity, but not predictive of disease flare-up. Lupus Sci Med 2014;1:e000027. Hamza RT, Awwad KS, Ali MK, Hamed AI. Reduced serum concentrations of 25-hydroxy Vitamin D in Egyptian patients with systemic lupus erythematosus: Relation to disease activity. Med Sci Monit 2011;17:CR711-8. Kim HA, Sung JM, Jeon JY, Yoon JM, Suh CH. Vitamin D may not be a good marker of disease activity in Korean patients with systemic lupus erythematosus. Rheumatol Int 2011;31:1189-94. Pakpoor J, Pakpoor J. Vitamin D deficiency and systemic lupus erythematosus: Cause or consequence? Oman Med J 2013;28:295. Yap KS, Northcott M, Hoi AB, Morand EF, Nikpour M. Association of low Vitamin D with high disease activity in an Australian systemic lupus erythematosus cohort. Lupus Sci Med 2015;2:e000064. Ruiz-Irastorza G, Gordo S, Olivares N, Egurbide MV, Aguirre C. Changes in Vitamin D levels in patients with systemic lupus erythematosus: Effects on fatigue, disease activity, and damage. Arthritis Care Res (Hoboken) 2010;62:1160-5. Petri M, Bello KJ, Fang H, Magder LS. Vitamin D in systemic lupus erythematosus: Modest association with disease activity and the urine protein-to-creatinine ratio. Arthritis Rheum 2013;65:1865-71. Adorini L, Penna G. Control of autoimmune diseases by the Vitamin D endocrine system. Nat Clin Pract Rheumatol 2008;4:404-12. Davatchi F, Jamshidi AR, Banihashemi AT, Gholami J, Forouzanfar MH, Akhlaghi M, et al. WHO-ILAR COPCORD study (stage 1, urban study) in Iran. J Rheumatol 2008;35:1384. Bonakdar ZS, Jahanshahifar L, Jahanshahifar F, Gholamrezaei A. Vitamin D deficiency and its association with disease activity in new cases of systemic lupus erythematosus. Lupus 2011;20:1155-60. Tan EM, Cohen AS, Fries JF, Masi AT, McShane DJ, Rothfield NF, et al. The 1982 revised criteria for the classification of systemic lupus erythematosus. Arthritis Rheum 1982;25:1271-7. Gladman DD, Ibañez D, Urowitz MB. Systemic lupus erythematosus disease activity inde×2000. J Rheumatol 2002;29:288-91. Singh A, Kamen DL. Potential benefits of Vitamin D for patients with systemic lupus erythematosus. Dermatoendocrinol 2012;4:146-51. Sakthiswary R, Raymond AA. The clinical significance of Vitamin D in systemic lupus erythematosus: A systematic review. PLoS One 2013;8:e55275. Abou-Raya A, Abou-Raya S, Helmii M. The effect of Vitamin D supplementation on inflammatory and hemostatic markers and disease activity in patients with systemic lupus erythematosus: A randomized placebo-controlled trial. J Rheumatol 2013;40:265-72. Andreoli L, Dall'Ara F, Piantoni S, Zanola A, Piva N, Cutolo M, et al. A 24-month prospective study on the efficacy and safety of two different monthly regimens of Vitamin D supplementation in pre-menopausal women with systemic lupus erythematosus. Lupus 2015;24:499-506. Mok CC, Birmingham DJ, Leung HW, Hebert LA, Song H, Rovin BH. Vitamin D levels in Chinese patients with systemic lupus erythematosus: Relationship with disease activity, vascular risk factors and atherosclerosis. Rheumatology (Oxford) 2012;51:644-52. Carvalho JF, Blank M, Kiss E, Tarr T, Amital H, Shoenfeld Y. Anti-vitamin D, Vitamin D in SLE: Preliminary results. Ann N Y Acad Sci 2007;1109:550-7. Aranow C, Kamen DL, Dall'Era M, Massarotti EM, Mackay MC, Koumpouras F, et al. Randomized, double-blind, placebo-controlled trial of the effect of Vitamin D3 on the interferon signature in patients with systemic lupus erythematosus. Arthritis Rheumatol 2015;67:1848-57.